Dying Phoenix is set against a background of fear and torture, under a military dictatorship in Greece. Max and Nina Hammett struggle to preserve a marriage that has become fraught with jealousy and despair. In April 1967, a totally unexpected military coup throws Greece into turmoil. People vanish amid terrified rumours of torture and murder. As these events unravel, so does Nina and Max’s marriage. Nina doesn’t trust Max, and leaves him in a jealous rage. But the truth of the matter is that Max was trying to help an abused woman escape her tormentor, not taking her to his bed as Nina imagines. Young, flighty Zoe’s angst puts Max in terrible danger from a ruthless murderer. At the same time, he must also try to find Nina, who has disappeared into the shadowy depths of Athens. He knows that her willful nature, along with her refusal to cater to the military, could get her killed. Hearing that she is in danger, he sets off on a journey across Greece to find her and to escape his own past. Dying Phoenix is a thrilling historical romance that covers an interesting, little-known period of Modern Greek history, and lends an insight into ordinary Greek lives. Stephanie: Hello, Loretta. Thank you for chatting with me today and congrats on the B.R.A.G. Medallion for your book, Dying Phoenix. Loretta: Thank you for inviting me, Stephanie. I was honoured to get the B.R.A.G. Medallion! Such a thrill to know people have enjoyed the book. Stephanie: What genre does your story fall under? Loretta: Although it’s set in my youth, the 1960’s are considered as history now! This is the period the story takes place covering a particular historical event in Greece yet still in the memory of living people. Stephanie: Tell me a little about the three right wing colonels. Loretta: The mid Sixties was a period when the US and other Western countries were very afraid of the rise of Communism. The three Colonels were minor members of the Greek army who were horrified by the idea of the Greek communists taking over, desecrating all they believed in as the ancient Greek ways, religious customs and morals. They decided to pull off a right wing military coup in 1967 to eradicate what they saw as a left wing threat to the country at the time. Stephanie: What is an example of the challenges the people faced under the rule of these colonels? Loretta: Many people felt relief to have the country under a tight dictatorship as democracy seemed to have led to civil unrest, strikes and problems. But others, the intellectuals, the humanitarians, those with a wish to better the lot of the poverty stricken villages were rounded up and disappeared, were tortured or otherwise intimidated behind a facade of calm control. Stephanie: Tell me a little about Max Hammett and his strengths? Loretta: One could say that Max loves and cares about women and always wants to champion them. This harks back to his unhappy youth when he saw his mother brutalised by his father. He can’t bear to see women suffer and often lands himself in hot water because of his good intentions. He is a generous, kind man and a loyal, good friend. Stephanie: What does he love about Greece? Loretta: He has married a Greek girl, Nina, and she has taught him to love her country. He loves the spontaneity and generosity of the Greeks. He enjoys their warmth and loyal friendship. But he also loves the atmosphere, scents, sounds, light, joyfulness that Greece represents for him. Stephanie: What are his wife’s weaknesses and strengths? Loretta: Nina is an impetuous, Amazon like woman. She is brave, independent, passionate and loyal to those she loves. She can be foolishly careless of her own safety. Her real weakness is a proneness to destructive jealousy and a refusal to listen to another viewpoint. This leads to a lot of trouble in her marriage with Max who was foolish enough to roam just the once. She won’t allow him to explain or even apologise and this has some dire consequences. Stephanie: What are some of the international attitudes in Greece and England you portray in your story? Loretta: It took some time for the frightful hidden tortures and imprisonment of innocent citizens to reach the rest of the world. Some Greeks managed to escape and tell others about it. The Scandinavians were the most indignant and ready to rouse international condemnation. However, the US and Britain, still afraid of the Communists, were rather pleased than otherwise to have a Right Wing government in Greece as it was considered a crucial country to keep free of the Red Peril! So they turned a blind eye and some say even actively helped the Junta. Loretta: The story is actually a sequel to The Long Shadow which was my first Greek story set in WW1 during the Salonika Campaign. That tale went from that period with the hero, Andrew Cassimatis, into the 1930’s. 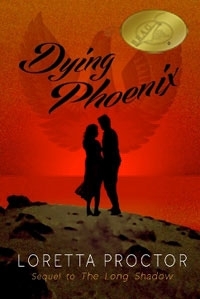 Dying Phoenix takes up the next big set of events after WW2 and follows the fortunes of Andrew’s daughter, Nina. Stephanie: Was there a particular scene you found a challenge to write and how long did it take to write your story? Loretta: Dying Phoenix took about a year to research and write. Although I know Thessaloniki and Athens fairly well and was actually there during the year of the coup, I went to Greece in order to interview people who recalled the events of that time and absorb the general background. I even chatted to a young man on the plane on the way over there who told me his father’s take on it. It was most interesting and enlightening to get these various points of view, Left, Right and Central! The scene that gave me a huge sense of challenge was when I wrote about the tortures that took place at Bouboulinas Street in Athens. The screams of victims were hidden by the revving of motorcycles in the street or the clanging of a brass drum. It was horrific reading the files on this. I didn’t include a half of the fearful things that went on there or it would have been upsetting to readers. As it was, a Greek friend found it very upsetting to realise what had taken place and was fearful things may be heading that way again. 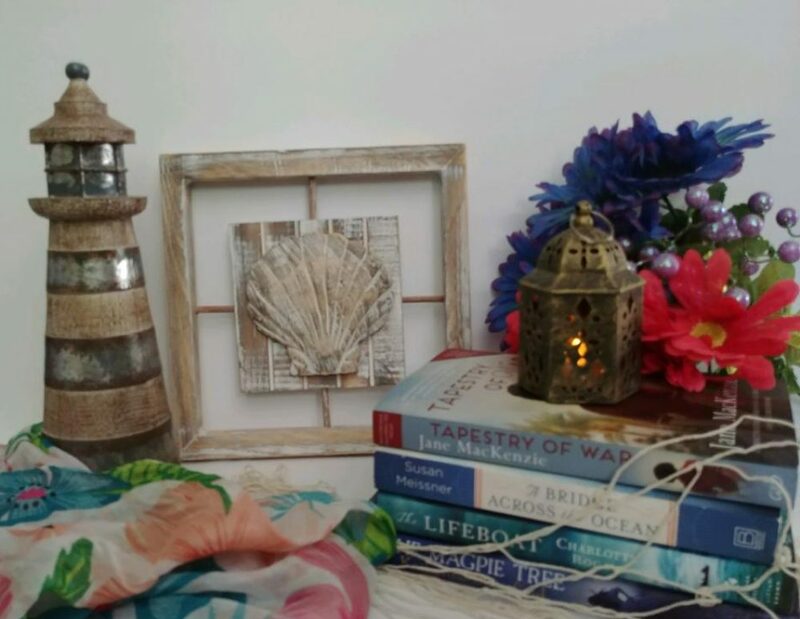 Stephanie: Where in your home do you like to write and what is your process for writing? Loretta: I write ‘on the wing’ as they say. It’s not my way to plot each scene carefully, I couldn’t even do that at school when I had to write an essay. I would write it first then make the plan afterwards! Somehow words just come pouring through and the characters take on their own life and I seem to be their instrument. I guess they all have a life somewhere in my subconscious mind! Obviously I go over it afterwards to make sure it all makes sense. Loretta: A wonderful author friend, Rebecca Locclann, said I should have a try to see if anyone liked my book. I’m most grateful for her advice. I think you’ve interviewed her too! Stephanie: I sure have! She is a lovely person. What is up next for you? Loretta: I am currently going over another Greek novel called The Glass Madonna. This is set in Crete and follows the unusual adventures of a very young, gentle and strange girl who goes there with her father, an archeologist. It has a supernatural element to it. A bit different to the current book but I like to have a change. Stephanie: Thank you, Loretta! It was a pleasure. Loretta is Anglo Greek, born in Cairo, Egypt. She came to England after the end of WW2 and has lived there ever since. Always with a book in hand from an early age, she developed a love and passion for beautiful words, books and literature and began writing early. However, personal events made her put story writing aside though she continued to publish several magazine articles and studied Jungian psychology and astrology for many years. She also did counselling work while bringing up her family. Now retired to the beautiful Malverns in England, she began writing again and The Long Shadow was her first published novel in 2006. This book is now being published and translated into Greek and will be out over there this November. Loretta looks forward to a book signing in Greece! Dying Phoenix is the sequel to this first book and she was requested to write it by many people who felt that little was known or understood about this particular period of Greek history. She has published two other books in between and has lots more manuscripts in the cupboard! We are delighted that Stephanie has chosen to interview Loretta Proctor, who is the author of, Dying Phoenix, of our medallion honorees at indieBRAG . To be awarded a B.R.A.G. Medallion TM, a book must receive unanimous approval by a group of our readers. It is a daunting hurdle and it serves to reaffirm that a book such as, Dying Phoenix, merits the investment of a reader’s time and money.